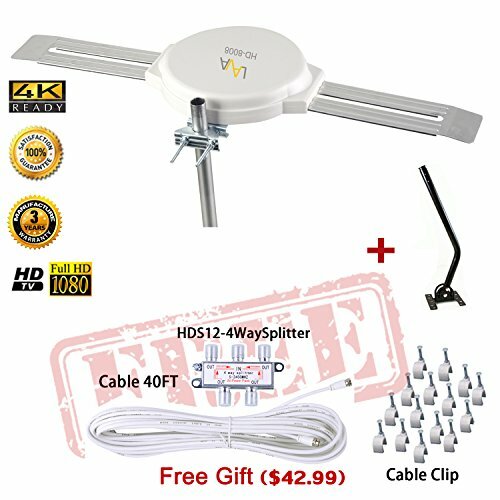 Ideal Distance 40-80 miles (reaches up to 130 miles) This is long range antenna best use for outdoor, so if you live very close to TV tower, you need to get a Indoor Antenna or the signal will be overshoot. Note: make sure to scan channels after install the antenna, or it may show 0 Channel. Antenna cable can not be longer than 50 ft, or it may receive 0 or less than it should be. LAVA HD8008 Omnidirectional Antenna is specially designed omnidirectional antenna that will receive both the VHF and the UHF TV signals without rotating. A latest concept for digital outdoor analog and terrestrial HDTV broadcasting reception. The antenna is one of the best solutions for both home and portable digital TV reception. Complete accessories are included for either wall or pole mounting. RV supported. Please understand that this is a simulation and can only be treated as a rough approximation. Reception at your location is affected by many factors such as multi-path, antenna gain, receiver sensitivity, buildings, and trees - which are not taken into account. Your reception may vary. This antenna is design for use outdoor and if your location is close to TV tower, this antenna may not get it's perfect result. Antenna Position 1. Mount the antenna as high as possible. 2. Clear of clutter in tower directions. 3. Pointed in direction of broadcast towers.